AFTER AN ENDLESS wait that felt like being trapped in a time loop, Doctor Who finally returned last night. I’ve never anticipated a Doctor Who season premiere quite like “The Pilot.” Peter Capaldi proved himself an amazing Doctor last season, blending shades of Eight and Four with his own unique style. The first episode of Doctor Who—”An Unearthly Child”—was the story of a misfit pupil in an educational establishment, and her unlikely relationship with a charismatic old man. “The Pilot” follows a similar arc in places, with nods to the Doctor’s past, while showing a new side of his character, one that is less keen to run and keep running, and more interested in making a long-term home for himself, somewhere with lots of books and lots of blackboards. When “The Pilot” begins, The Doctor is living and teaching at a fictional university in Bristol. He’s been there for the past 50 years—yet, nobody seems to notice that one of the professors has outlasted even the most determined of tenured faculty. As it’s a tribute of sorts to the very early days of Doctor Who, it’s fitting that the two romantic leads in the story should have the names, Bill and Heather. William Hartnell, the First Doctor, was known as Bill or Billy, and Heather was the name of his wife of 46 years. But let’s talk about our newest companions. Matt Lucas as Nardole continues to be a gift to the show, and the perfect foil for Capaldi in a way I would argue hasn’t been seen since Frazer Hines as Jamie. I’m also really enjoying the fact that the show is apparently never going to explain what he actually is. A screw falls out of him at one point, but he also has a biological head that needs glasses for seeing properly, and apparently he poops (aside: “The Pilot” established, for what I believe is the first time on television, that the Tardis does, in fact, have a toilet, which used to be a significant topic of debate). He gets some of the best lines in the episode but tempers it with a compassionate pathos that is endearing. 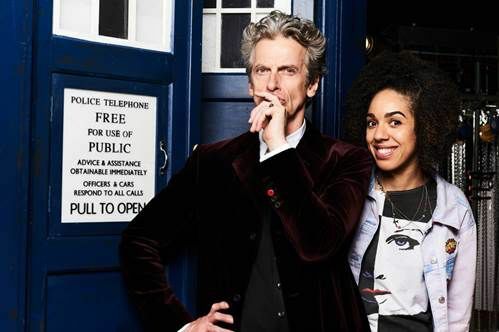 Pearl Mackie’s Bill Potts was the big news, though, as the latest of the plucky young women who run off with The Doctor. She is also the first truly full-time LGBT companion in the series’ long history. Jack Harkness and Oliver Harper both blazed trails in representation, and the latter is one of my favorite companions, but both only traveled in The Tardis for a handful of episodes. Bill is slated to be here for an entire season, and Heather starts out as her love interest in the episode right off the bat. It’s been a pleasant winding down of the romantic subplots that focused on companions and their Doctors that plagued the last two incarnations, and I’m glad Bill is here to continue the process. Other companions have certainly been intelligent. Liz Shaw and Charley Pollard come immediately to mind, but both had a tendency to just point and ask for an explanation. Bill is much more of a detective, even to the point she knows The Doctor plans on erasing her memory. It puts her in an interesting position, as The Doctor himself comes to grips with his feelings of inadequacy as the universe’s constant savior. In his office, only three testaments to his travels appear; his bust of Beethoven, a jar with all his previous sonic screwdrivers (save the War Doctor’s), and portraits of River Song and Susan Foreman. In a way, he has more truly abandoned being The Doctor than even Ten did in “Human Nature,” and I really want to find out why. Meanwhile, the plot is somewhat forgettable: it revolves around Bill’s crush on a girl named Heather (Stephanie Hyam), who discovers a puddle that gives a strange reflection. (It’s one of writer Steven Moffat’s trademark “optical effect” monsters.) After Heather takes a dip in the puddle, she comes back as a watery zombie—not unlike the watery zombies in the 2009 Who special “Waters of Mars”—who then chases Bill and the Doctor all over the universe. The real heart of the episode, though, lies in the spiky student-teacher relationship between the Doctor and Bill. With the Doctor an actual teacher (instead of simply lecturing on an amateur basis), his sparring with Bill is more vital and urgent than it has been with other recent Companions. And after years of the scarily competent Clara, it’s refreshing to see the Doctor paired up with a human who’s just figuring out the ropes—and whose quirky observations help to deflate the Doctor’s pomposity. Overall, it was a hell of an episode. It’s been a while since showrunner Steven Moffat gave us a truly frightening monster, and Heather/The Pilot was one of his best. She was basically a science-fiction version of a rusalka, and Stephanie Hyam did an excellent job conveying both menace and tragedy as she stalked the Tardis crew across time and space like a BBC version of It Follows. Series 10 is off to a great start. It’s got its flaws, but it’s got its triumphs as well. I’m not looking forward to Capaldi’s exit, because this is just getting more fantastic by the minute.